Cal Sastre Cartellà has two floors. Rented to one single group. There is central heating. 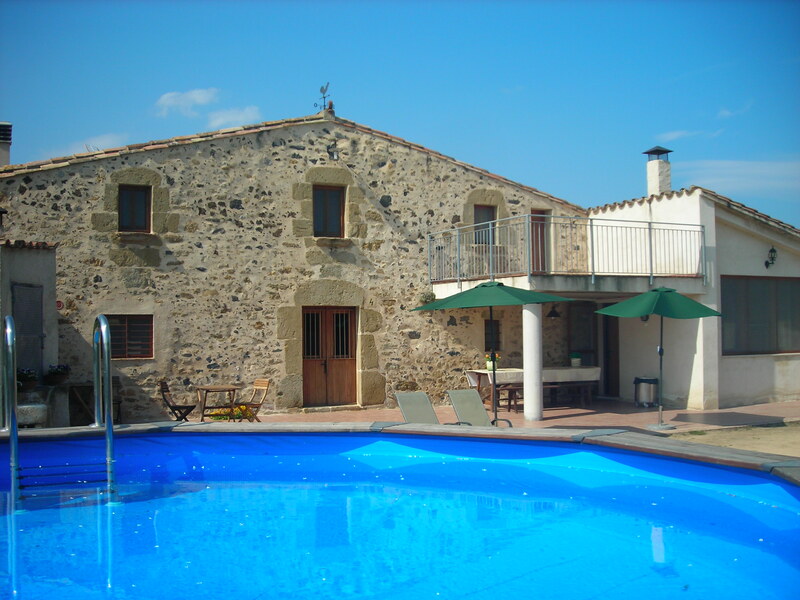 On the first floor there are 4 double bedrooms: one with a king-size bed and the front terrace, 1 bedroom with king-size bed in the front of the farmhouse, 1 bedroom with king-size bed and views to the west of the house (Rocacorba, Guilleries) and one with two single beds. All rooms have duvets linens and towels. Also on the first floor there is a bathroom, a toilet and a lounge with TV, DVD and satellite channels. Downstairs: entering through the front door on your right is the kitchen (microwave, fridge, freezer, oven, blender, toaster, coffee maker, dishwasher, fireplace, kitchen equipment and utensils to set the table properly ) and a table with 8 chairs, tablecloths, tea towels and aprons. The kitchen has a fireplace with two chairs. Downstairs you can also find two bathrooms, a double bedroom with two single beds, a room with a king-size bed and a room with a single bed and one king-size. Two travel cots, plus an extra bed. Outside private walled garden, table and chairs for outdoor dining if you fancy, barbecue, swimming pool, deck chairs, bicycles (5), terrace, parking area, table tennis, badminton, basketball, football, volleyball, darts . Pets are welcome. Cottage ideal for getaways with children, family gatherings celebrations, parties and meetings with friends. Exterior: Barbecue, Garden, Garden furniture, pool, terrace, parking area. Location: tarmac entrance, outside the village, isolated, mountain, signposted, near a river, swimming area in a river 7km away.